^ Breschini, Gary S.; Trudy Haversat (1986). "Archaeological Investigations at CA-MNT-149, In the Del Monte Forest, Monterey County, California". Retrieved 22 June 2012. ^ Breschini, Gary S.; Trudy Haversat (Winter 2002). 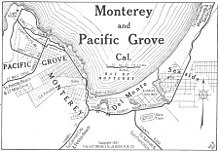 "Radiocarbon Dating and Cultural Models on the Monterey Peninsula, California" (PDF). Pacific Coast Archaeological Society Quarterly. 38 (1). Retrieved 22 June 2012. ^ Bolton, Herbert E. (1927). Fray Juan Crespi: Missionary Explorer on the Pacific Coast, 1769-1774. HathiTrust Digital Library. pp. 240–241. Retrieved 2 May 2014. ^ "Larkin House". Retrieved 2008-03-14. ^ "Custom House". Retrieved 2008-03-14. 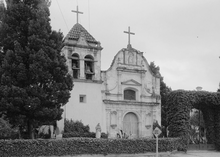 ^ "Royal Presidio Chapel". Retrieved 2008-03-14. ^ "Cooper-Molera Adobe". Retrieved 2008-03-14. ^ "Colton Hall". Retrieved 2008-03-14. ^ Ryce, Walter (12 August 2014). "Monterey's art scene was misrepresented for years on Wikipedia. Is it any better now?". Monterey County Weekly. Retrieved 14 August 2014. ^ "Monterey Today". Viamagazine.com. Retrieved 2009-02-09. ^ Grunenberg, Christoph; Jonathan Harris (2005). Summer of Love: Psychedelic Art, Social Crisis and Counterculture in the 1960s. Liverpool University Press. p. 347. ISBN 978-0-85323-929-1. Retrieved 2009-01-08. ^ Walser, Robert. L. Macy, ed. 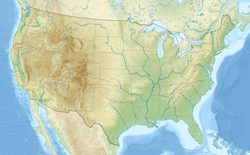 "Pop III, North America. 3. 1960s". Grove Music Online. Retrieved 2008-01-24. ^ "Monterey Bay Blues Festival files for bankruptcy". Retrieved 2018-08-16. ^ "Guide to the California First Theater Collection" (PDF). Oac.cdlib.org. Retrieved 12 August 2018. ^ "SPOTLIGHT ON... The Bruce Ariss Wharf Theater". Monterey County Theater Alliance. Retrieved 2009-02-09. ^ FELDMAN, PAUL (1993-12-06). "Frank Zappa, Iconoclast of Rock, Dies at 52". Los Angeles Times. ISSN 0458-3035. Retrieved 2016-02-28. ^ "City of Monterey, California Comprehensive Annual Financial Report, for the Year ended June 30, 2015" (PDF). Monterey.org. Retrieved 2015-11-08. ^ "Military-Municipal Partnerships". City of Monterey. Retrieved 2 February 2016. ^ Seitchek, Glenn; Bonner, Steve (September–October 2013). "Helping Defense Communities Save Money". The Military Engineer. September–October (685): 57–58. Retrieved 2 February 2016.